With the augmentation of Android OS and some data hungry applications it’s pretty much difficult to keep up your data charge under a specific budget. 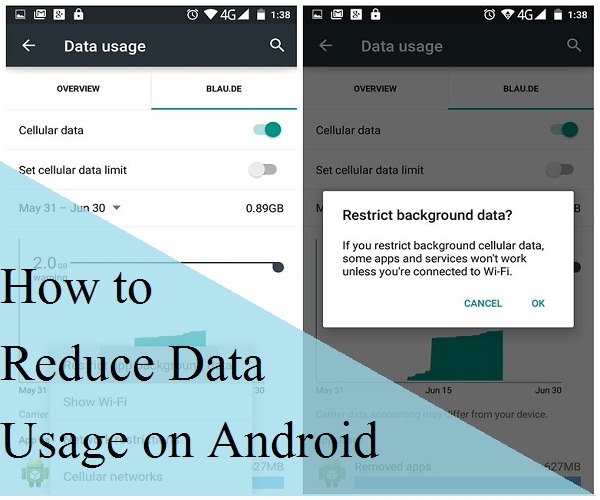 We understand your concern that is why we’ve provided some excellent tips guide here that will help you to reduce internet data usage in Android Phone. The number of internet users has rapidly grown in the last few years as a result the internet providers has increased the cost of internet data packs. I remember that four years back at 97 INR, i was getting 4 GB but today to get 4 GB I’ll have to pay 500 to 600 Rs. approximately. The most disappointing thing where in last few years smartphone has developed its market across the world but at the same time all the services like call rates, internet packs and other services are getting higher in cost day by day. The problem doesn’t end here, there are several data hungry apps that eats your data by sending notifications, updating software and several other activities. To check how much data you require per month or weekly, Go to main Menu find and click on Settings icon. Once you’ve opened the settings, scroll down and find Data Usage in Network and connections option and just click on it. If you are using some previous Android version then you must require a third party application to use this but if you’re user of Android 4.0 or other newer Android version then this service is for you. By clicking on Data Usage option you may easily check data usage for different applications. This is pretty much helpful to choose monthly internet plan accordingly. Removing useless applications is another good choice to have better internet experience. I am sure there would some applications be in your android phone which you seldom use. People never utilize all the apps from the phone. But this application runs in background and eats your data by providing time to time update. To reduce internet data usage, it’s better to remove or uninstall these useless application from your device. Use App Backup and Restore tool to maintain backup application file in your smartphone. This is the most amazing feature which lets you manage unnecessary data use in your device. It doesn’t matter whether you use the application or not, it consumes data in both the condition. Gmail and Whatsapp like application always send notification in the background if you get any new mail or messages respectively. Restrict useless application to run in the background by restricting background data usage. An auto update feature is the pretty much helpful sometime but it eats your data most while updating your application. So if you are using mobile data then you must disable auto application update feature. It will reduce your most of the internet data usage. To disable auto app update, go to, Google Play > Settings > Auto-Update Apps > Choose “Don’t Auto Update applications”. Apart from that you may select the auto application ON over Wi-Fi only. To do this go to Google Play > Settings > Auto-Update Apps > Select Auto update applications over Wi-fi Only”. To reduce internet data usage, lightweight internet browser is very much helpful. Most of the internet browsers are heavier in size and weight which consumes a lot of date while loading a page. I personally recommend you to go with opera mini which is really lightweight and consumes less amount of data comparing others.